I'm reading Joe Jones by Anne Lamott...and just came across this quote that made me laugh in recognition: "She thinks: Being me is just so time consuming." The Little House on the Prairie series was the first I ever read by myself...I can't remember how old I was, but I remember how much I loved following Laura's adventures. The wagons and wide prairies and cozy nights tucked in with the sound of Pa's music - it all thrilled me. The books spurred much of my early 'pretend' playing and influenced my choices throughout childhood...such as my insistence that my sister and I name our bikes so that they could be our 'horses'....and many, many, many games of 'pioneer'. Following the Little House books, I began to read more pioneer stories written for kids...and then fell in love with books by Janette Oke (this was also because of my lovely grandmothers, who both let me raid their bookshelves and taught me by example that books are to be loved). The majority of Janette Oke's Christian books are set in the 1800s and gave me the grown up's perspectives of those courageous settlers. I was thinking about all of this because I unpacked long-closed boxes of books from those days and kept taking out book after book with this theme...(though Laura's books have been safely on my shelves, most of my childhood reading materials have been packed up in the garage)...it makes me smile, to think of how ready I was for some adventure of my own (and how much I longed to live in a dugout by a creek). I looked up the Laura Ingalls books this morning and found that they've been remarketed for the younger generations....which is good. I hope I can pass this love of mine down to my own kids...especially if I ever have a girl. Because Laura Ingalls is definitely full of girls-can-do-anything antecdotes. Here's a cool list of recipes and activies drawn from the books - all fun ideas! I'm glad my parents gave me those books so long ago...they opened up an entire world with that simple gift. First, I'd like to say thanks for all of the birthday wishes I received here and for all of the wonderful book suggestions given in the fairy tale post...I am a year older, but at least I have lots of reading material to spice up the new year! Currently, I need an attitude makeover. I'll share a little bit of my feelings here, because I know that other moms read this blog - and hopefully, you'll recognize where I'm coming from. So maybe venting a little to you, blogosphere, will ease up some of the frustration. In hopes of reminding myself of what I should be saying instead of complaining, I'm including a classic prayer written by St. Thomas Aquinas that I have always loved. 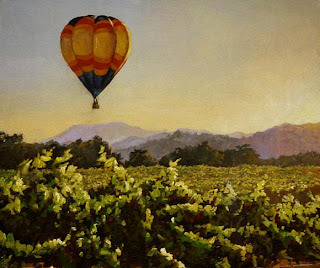 I'm also adding a wonderful painting by Craig Nelson, an artist I have just discovered. Definitely check him out. "Grant, O Lord my God, that I may never fall away in success or in failure; that I may not be prideful in prosperity nor dejected in adversity. Let me rejoice only in what unites and sorrow only in what separates us. May I strive to please no one or fear to displease anyone except Yourself. May I seek always the things that are eternal and never those that are only temporal. May I shun any joy that is without You and never seek any that is beside You. O Lord, may I delight in any work I do for You and tire of any rest that is apart from You. My God, let me direct my heart towards You, and in my failings, always repent with a purpose of amendment." You fall asleep on your keyboard while drumming up scenes (literally, keyboard imprints on face and legs numb from awkward crossed position). Yes, that's right. Your own brain children (ie, characters) bore you into unconscious slumber. That, my friends, is an undeniable sign. The temperature at noon today was at about 107. It is miserably hot here in the southern part of the US this week...opening the front door feels like opening the oven door. When I break a sweat just getting the kids into the car? Yeah. That's too hot for me. My posts have been scanty this week...we've had much more activity around here than usual. Vacation Bible School began on Monday. It's Sean's first year and he is having a blast...every day he comes home full of information about his lesson, snacks, and games. Christian has been having his own party in the nursery section of the church. New toys and animal crackers! Woo! I was recruited to work in the craft station, so I've been busy with hot glue guns and pipe cleaners. The theme for the week was Water Works Park and so the kids, at least, have been able to cool off outside with water games. I've been really tempted to jump in on one of those! Tomorrow's the last day. I mentioned this to Sean earlier today and he asked me (again) if kindergarten is next. Sigh. Those wings are spreading...and the Mommy is already feeling some separation anxiety. I guess this is the bittersweet nature of parenthood. We work hard to teach them independence and are so pleased when they can feed themselves and no longer need diapers and drink from big kid cups...but then the day comes that they're ready to go out into the world and use that independence without us. And we know it's good and important that they do this growing up thing - but we can't help wishing it all hadn't gone by quite so quickly. But Who Gets Custody of Santa? I find this article from the Telegraph.co.uk extremely interesting. Apparently the North Pole has been claimed by Russia..."veteran Arctic explorer Artur Chilingarov descended 14,000 feet in a three-man deep sea submersible and dropped a Russian tricolor cast in titanium onto the seabed." People aren't too thrilled with the idea. Despite the agreement made within the boundaries of the UN about this territory, it's bound to get ugly as there's believed to be ten billion barrels of oil waiting for a happy owner to claim them. Add that to the global warming issue and you've got a place important to the future of the earth...(those melting ice sheets, experts are saying, could even open up the infamous North East passage for commercial traffic within eight years). Who knows what will happen? I just hope it's managed peaceably. Because the elves do not handle conflict well. I'm a mom to Sean, Christian, and Kailey, and a wife to Neil. I love spending time with my family, watching fireflies in the Southern dusk, reading quality novels, and writing fiction...I believe in God, in love, and in cherishing the miracles and mercies of each day. Things that go bump in my head.